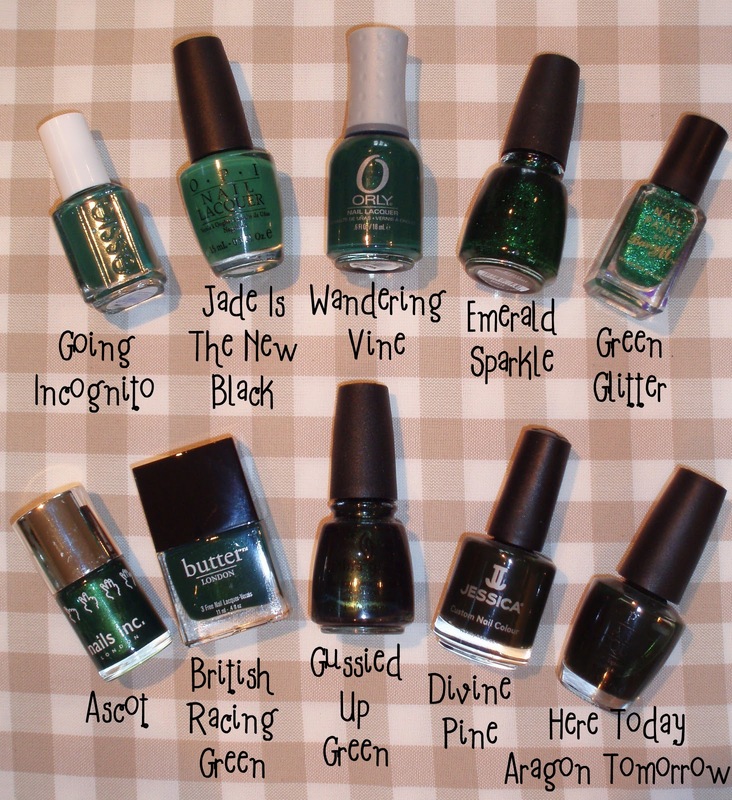 My previous post features Essie's Going Incognito as my nail of the day, it got me thinking about this unusual colour for nail polish and how my collection and adoration for shades of green has grown over the last couple of seasons. I think this is my favourite set, I love the sophistication of the darker shades of green. I love the more frivolous shades too, the minty colours are summer favourites and the khaki greens are a current nail varnish trend. OPI are bringing out a green, Don't Mess With OPI, in their soon to be launched Texas collection, and I will be adding this to my stash. It would seem that many brands are taking green seriously, Essie used to be very much about reds, pinks and sheers. Their most recent collections have featured greens as the stand-out colours and we have snapped them up. Butter London's British Racing Green caused a stir during fashion week when its creator Nonie Creme manicured the models with this specially mixed hue and it's known as one of the brands signature colours. I know green is not everyone's cup of tea, I do feel its an either love it or hate it type colour. I don't wear it that often as the company colours of my workplace are green and I get teased a work when I wear the colour so I reserve it for the weekends or nights out making it a special colour for me when I do adorn my nails! Do you like green or is this a colour you would avoid? !